Tudal Winery lies just a grape's throw off Hwy 29 on the northern edge of St. Helena along the Napa River within the shadow of the eastern mountains. Visitors of any age can find something to explore, whether it is the array of Napa Valley wines; our bocce court, the enticing flower and produce gardens or the collection of historic farm tractors, tools and bygone novelties that make up a fascinating agricultural retrospective. We have gardens and a lawn area for picnics (please call for availability). We have availability for tastings both indoors and outdoors, two barrel rooms, outdoor areas include: our Potting Shed and our Garden Arbor area. We can seat from two (2) to fifteen (25) people comfortably outdoors and from two (2) to twelve (12) people comfortably indoors. You can enjoy a tour & tastings and then enjoy a relaxing picnic lunch in our gardens or on our lawn. Wine Education: Discussion of the winemaking process and how growing areas affect the development of wines. To join the wine club, visit www.tudalwinery.com or call 707-963-3947. FOUNDERS CLUB - 20% Discount on all Tudal Winery, Tudal Family Winery & Cerruti Cellars wines. Receive twelve (12) bottles of wine, four time a year (Winter, Spring, Summer & Fall). 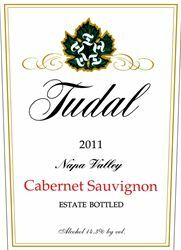 FAMILY CLUB - 20% Discount on all Tudal Winery, Tudal Family Winery & Cerruti Cellars wines. Receive six (6) bottles of wine, four times a year (Winter, Spring, Summer & Fall). FARMERS CLUB - 20% Discount on all Tudal Winery, Tudal Family Winery & Cerruti Cellars wines. Receive three (3) bottles of wine, four times a year (Winter, Spring, Summer & Fall). No cost to join any of our wine clubs. Enjoy our parties throughout the year, receive offerings for Wine Club members only, and enjoy VIP visits (you & up to 4 of your friends receive complimentary tasting flight of 5 wines and no charge to picnic).